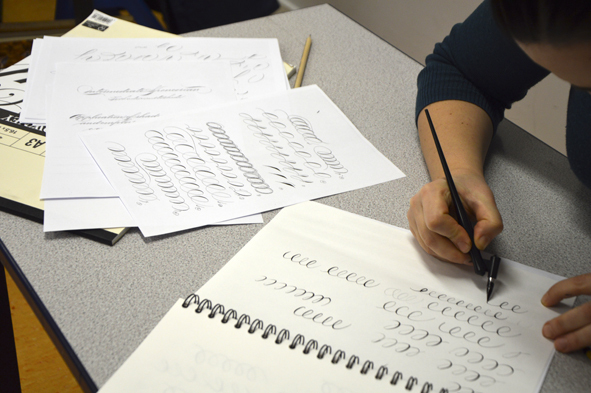 At our first workshop for 2017, we hosted the talented James Farrell to teach lettering enthusiasts the art of Spencerian flourishing. 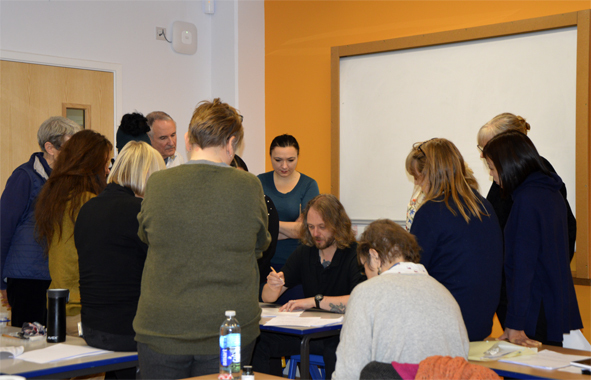 It was a full class for our workshop on Saturday 14th January 2017 with James Farrell. 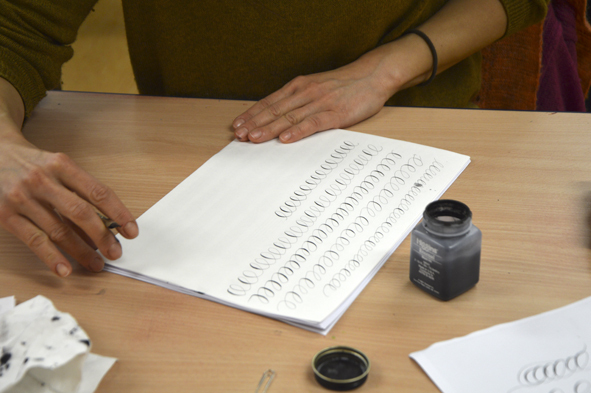 This was his third workshop for the SLLA on the subject of Spencerian Script, which dates back to the 1840s in the US. 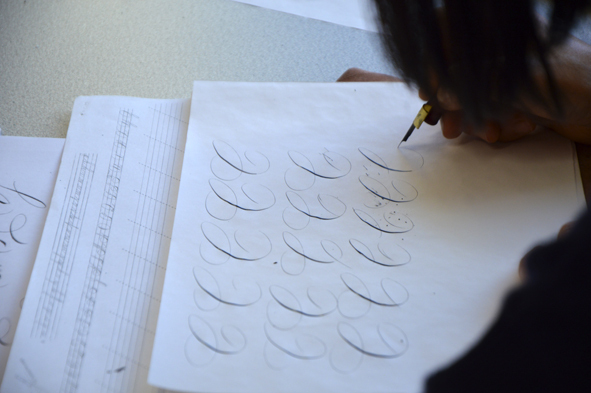 James told us that after studying mechanical engineering, he began teaching himself Spencerian and Round Hand (Copperplate). He discovered IAMPETH on the internet — an international association, founded in the US in 1949, dedicated to practising and preserving the beautiful arts of calligraphy and penmanship. James has taken his penmanship a step further, developing a modern style of pointed pen lettering and art inspired by the patterns in natures and the cosmos. He has taught workshops all over Italy, the US and England during the last five years. 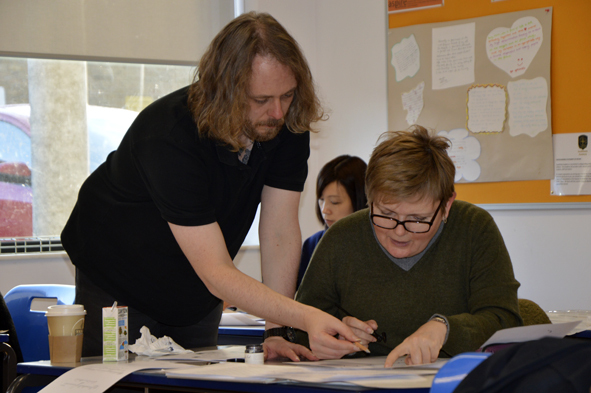 James gave us a handout which included examples of work from an excellent book ‘An Elegant Hand’ and samples of his own work. Tossing back his long hair, looking more like a Pre-Raphaelite poet than a calligrapher (what does a calligrapher look like?) he demonstrated the warm up exercises he always starts his own practice with, and he practices for several hours every day. This is definitely not an easy hand to master, and requires a light and delicate touch. 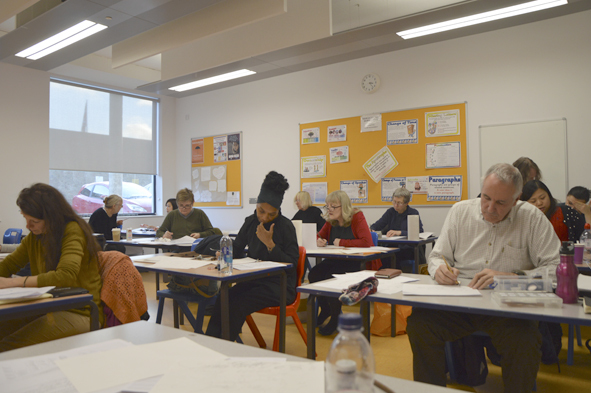 Surprisingly, we were encouraged not to write too slowly, rather to get a rhythm going to give fluidity. James said he practises listening to Jazz music! 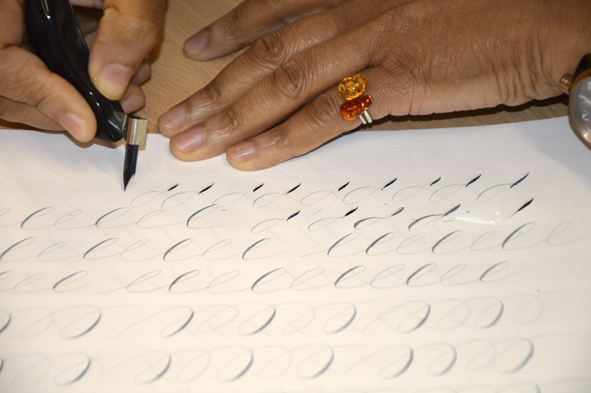 It is important to work with your paper at a slant and find a good pointed pen nib that suits you. Leonard Principle and Vintage Hunts were recommended. Also an elbow or straight pen holder – its good to experiment to see what suits you best. 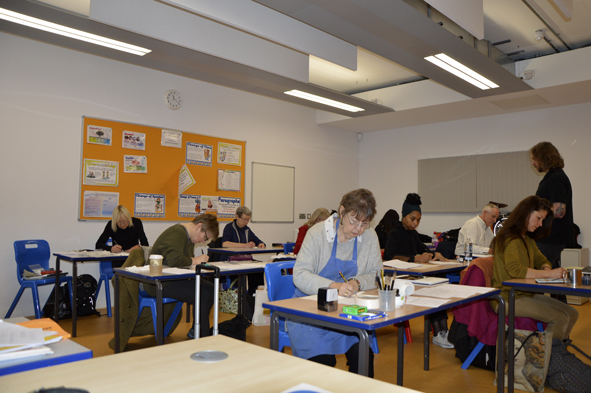 Also important is to sit comfortably and use a mixture of finger, wrist and full arm movements to get the right oval shapes required in the letters and the flourishes. We worked really hard all day. 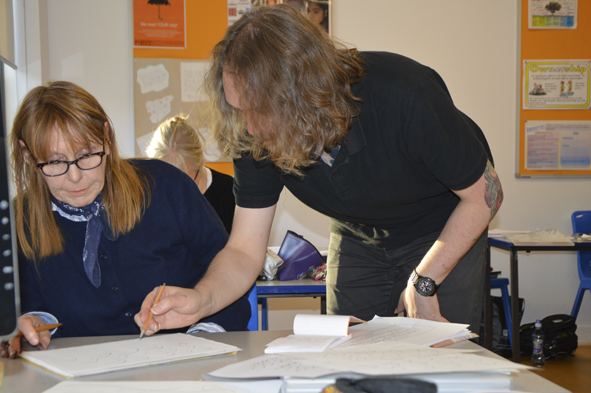 James gave several demonstrations and in between time came around the classroom giving individual help and encouragement. He also showed us some of his interesting paintings which can be seen on www.jamesfazzfarrell.blogspot.it. 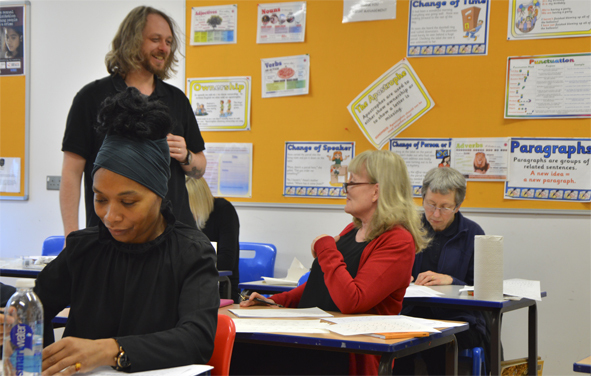 James plans to give more workshops and urged us to practise often and send him our work for his comments. 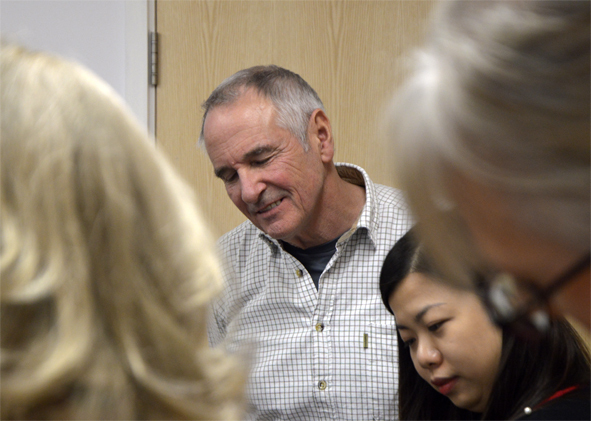 James was a very generous teacher and we all enjoyed very pleasant day.